“The petitioners have not fleshed out their arguments to challenge the rule. That’s all to come,” attorney Michael Littenberg of the firm Schulte Roth & Zabel LLP told The Wall Street Journal. The Chamber of Commerce and the NAM have long argued that the conflict minerals provision of the Dodd-Frank Wall Street Reform bill would be too cumbersome and costly to implement, given the complexity of the supply chains that originate in war-torn eastern Democratic Republic of Congo. However, many companies have publicly committed to being conflict free. Others have already begun making strides to comply with the U.S. regulations or initiated efforts to ensure their sourcing of minerals from eastern Congo doesn’t contribute to the funding of Congolese armed groups. The Dutch Ministry of Foreign Affairs announced today that the first bags of conflict-free tin, sourced from a mine in South Kivu and certified by the Conflict Free Tin Initiative, or CFTI, are on their way to the production line for Philips products. Philips was one of the architects of this project. The Solutions for Hope program that includes HP, Intel, Nokia, Motorola, and the Public Private Alliance that includes AT&T, Ford, General Electric, Verizon, and others are all currently creating or supporting systems to source responsibly from the region. [R]equiring companies to exercise due diligence is effective. 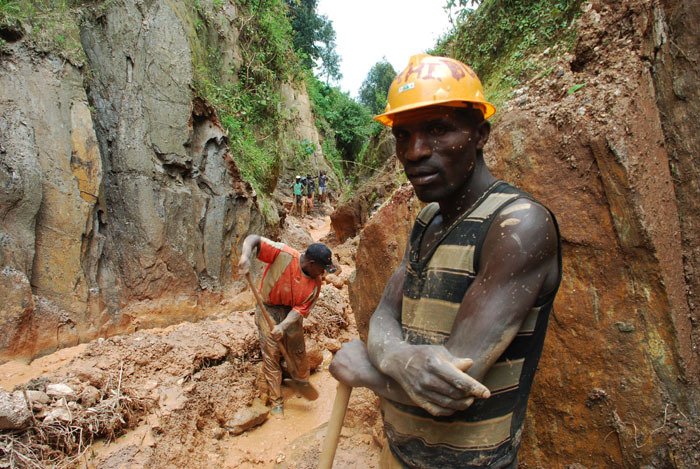 The Group's investigations in the DRC have shown that private sector purchasing power and due diligence implementation is reducing conflict financing, promoting good governance in the DRC mining sector, and preserving access to international markets for impoverished artisanal miners. […] Since the signing into law of the Dodd Frank act, a higher proportion then before of tin, tungsten and tantalum mined in the DRC is not funding conflict. This type of constant, sustained, and coordinated pressure is needed to rid supply chains of minerals that fuel human rights abuses. Provision 1502 of Dodd-Frank and the SEC’s final rule do just that. The lawsuit initiated by the chamber and the NAM threatens that progress because it relieves supply chains of the needed pressure to support positive change and sustainable development. It is disappointing, though not surprising, that the Chamber of Commerce and the NAM have taken this step. It is ill advised and misguided. The Enough Project is grateful for the industry support from members of the chamber and the NAM who recognize the importance of ensuring that their supply chains do not perpetuate human rights abuses. The SEC’s rule is based on a sound and thorough analysis, and Enough and our allies stand ready to use every tool at our disposal to defend it. In the meantime, it is essential that the lawsuit not force the postponement of the reporting requirements called for in the rule released in August. Under those terms companies are required to file their first disclosure in 2014. It is likely the industry will ask the SEC to stay the rules pending a resolution in court. Whether the SEC will agree is an open question but one Enough will actively oppose.